Today I am hosting the post for the Vintage Heartfelt Blog, I made this "Christmas Snow" A2 Card using some left over Pink Paislee Mistletoe & Co that I had from last year. My stamp is from Stampers Anonymous, love those stamps. I embossed with Chestnust Zing. I first did all of my distressing using the Tim Holtz distress tool and Chestnut Roan ink. 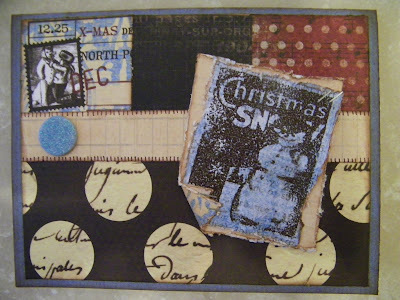 I attached the tag to the top of the card and stapled it with the Tim Holtz tiny attacher. 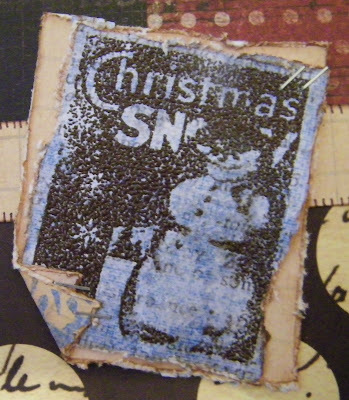 After my card was complete done I then added Rock Candy Stickles to the top of my Snowman image.